R users require local system accounts regardless of what RStudio authentication method you use. You should set up local system accounts manually and then map authenticating users to these accounts. You can also use PAM Sessions to mount your user home directory to the server. Note: Not all RStudio products require local system accounts. Shiny Server and RStudio Connect serve end users, not R developers, so these products can be configured without local system accounts. RStudio Server Professional Edition authenticates users via the Linux standard PAM (Pluggable Authentication Module) API. PAM is typically configured by default to authenticate against the system user database (/etc/passwd) however it can also be configured to authenticate against a wide variety of other systems including ActiveDirectory and LDAP. The section describes the PAM configuration used for authentication by default after installation. Note that PAM can be used for both authentication as well as to tailor the environment for user sessions (PAM sessions). This section describes only authentication, see the [User Resources and Limits] section for details on how RStudio Server can be configured to use PAM sessions. PAM profiles are are located in the /etc/pam.d directory. Each application can have their own profile, and there is also a default profile used for applications without one (the default profile is handled differently depending on which version of Linux you are running). If the /etc/pam.d/other profile reflects the authentication system and policies that you’d like RStudio Server to use then no further configuration is required. If you want to create a custom PAM profile for RStudio you would create a file named /etc/pam.d/rstudio and specify whatever settings are appropriate. If you are unable to login to RStudio Server there may be an underlying problem with the PAM configuration. The best way to diagnose PAM configuration problems is to use the pamtester utility (which is bundled with RStudio Server). Using pamtester enables you to test authentication in an isolated environment as well as to see much more detailed diagnostics. You can find more detailed documentation on using pamtester here: http://linux.die.net/man/1/pamtester. Setting this option to 0 will result in users being prompted to log in each time they start a new browser session (i.e. logins will only be valid as long as the browser process in which they originated in remains running). By default RStudio Server only allows normal (as opposed to system) users to successfully authenticate. The minimum user id is determined by reading the UID_MIN value from the /etc/login.defs file. If the file doesn’t exist or UID_MIN isn’t defined within it then a default value of 1000 is used. Note that it’s possible that your PAM configuration is also applying a constraint on user-ids (see the Default PAM Configuration section above for an example). In this case you should ensure that the auth-minimum-user-id is consistent with the value specified in your PAM configuration. Note that it’s critical that you include the -a flag as that indicates that the group should be added to the user rather than replace the user’s group list in it’s entirety. 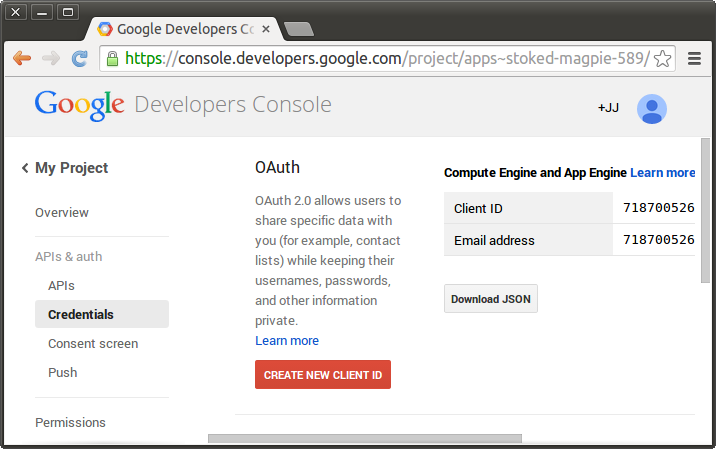 RStudio Server can be configured to authenticate users via Google Accounts. This enables users to login with their existing Gmail or Google Apps credentials and to be automatically authenticated to RStudio Server whenever they are already logged into their Google account. You should select “Web application” as the application type and provide two URLs that correspond to the server you are deploying on. The screenshot above uses https://www.example.com as the host, you should substitute your own domain and port (if not using a standard one like 80 or 443) in your configuration. This will result in two values which you’ll need to provide as part of the RStudio Server configuration: client-id and client-secret (they’ll be displayed in the Google Developer Console after you complete the dialog). Note that the above client-id and client-secret aren’t the actual values you’ll use. 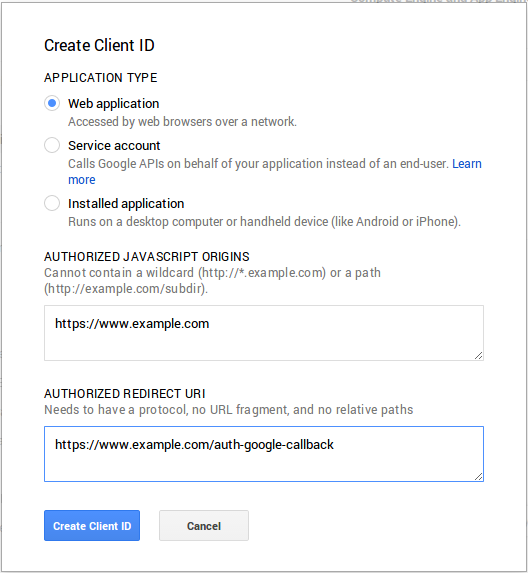 Rather, you should substitute the values that you obtained from Google when registering your site for OAuth authentication. Once you enable authentication with Google Accounts that becomes the exclusive means of authentication (you can’t concurrently use both PAM and Google Account authentication). Once a user is authenticated via Google Accounts it’s necessary to map their Google Accounts identity to a local system account. The default and most straightforward way to do this is to create a local account with a username identical to their Google email address. If you choose to create local accounts that match Google email addresses be sure to use only lowercase characters in the account name, since Google email addresses are transformed to lower-case prior to matching them to local account names. Note that the --force-badname option is only available on Debian/Ubuntu systems and is not available on RedHat/CentOS or SLES systems. Note that changes to the google-accounts configuration file take effect immediately and do not require a server restart. If you are running RStudio behind a proxy, you will need to configure your proxy to set its host name in the X-Forwarded-Host header so that RStudio can tell the Google Web Services to redirect back to the correct location. For example, if your proxy was set up to serve RStudio requests at http://testdomain.com/rstudio/, you would want to ensure that the proxy set the X-Forwarded-Host header to http://testdomain.com/rstudio/. Otherwise, RStudio will attempt to redirect back to its internal address. You can configure RStudio Server to participate in an existing web-based single-sign-on authentication scheme using proxied authentication. In this configuration all traffic to RStudio Server is handled by a proxy server which also handles user authentication. In this configuration the proxy server adds a special HTTP header to requests to RStudio Server letting it know which authenticated user is making the request. RStudio Server trusts this header, launching and directing traffic to an R session owned by the specified user. The specified user must have a local system account on the server. You should set up local system accounts manually and then map authenticating users to these accounts. The sign in URL should host a page where the user specifies their credentials (this might be for example the main page for an existing web-based authentication system). After collecting and authorizing the credentials the sign in URL should then redirect back to the URL hosting the RStudio Server. When the user clicks the “Sign out” button in the RStudio IDE user interface. You should be sure in setting up the proxy server that traffic bound for the sign-in URL is excluded from forwarding to RStudio Server (otherwise it will end up in an infinite redirect loop). Note that is highly recommended that you do not use the default X-RStudio-Username header name. The reasons for this are described in the section on security considerations immediately below. The format of a re-write rule is a regular expression followed by a space and then a replacement string. The replacement string can reference captured parts of the regular expression using $1, $2, etc. Using the the default header name X-RStudio-Username creates a security problem: code running behind the proxy (i.e. code within R sessions) could form requests back to the server which impersonate other users (by simply inserting the header in their request). sudo sh -c "echo 'X-Secret-User-Header' > /etc/rstudio/secure-proxy-user-header"
When implementing the proxy it’s important to remember that RStudio Server will always trust the username header to authenticate users. It’s therefore critical from the standpoint of security that all requests originating from the proxy have this header set explicitly by the proxy (as opposed to allowing the header to be specified by a remote client). 127.0.0.1 - - [29/Jun/2015:06:30:41 -0400] "GET /s/f01ddf8222bea98a/ HTTP/1.1"
AppleWebKit/537.36 (KHTML, like Gecko) Chrome/43.0.2357.125 Safari/537.36" "jsmith"
Note that the very last item in the log file entry is "jsmith". This is the username that RStudio Server read from the header passed by the proxy server. If this shows up as blank ("-") then your proxy server isn’t forwarding the header or using the correct header name in forwarding. Important Note: Once you’ve concluded troubleshooting it’s important that you remove the server-access-log=1 option from the /etc/rstudio/rserver.conf file (since this log file is not rotated it will eventually consume a large amount of disk space if you don’t remove the option).